Some cars are lucky and some are not. The Triumph TR series definitely falls into the first category, for its launch could not have been less favourable. Yet for 9years the same well known range of sports cars sold strongly - more than80,000 were built – and put the Triumph name firmly back on the motoring map. It all started in the early 1950’s, when Standard-Triumphs chairman, Sir John Black, was inspired to produce a sports car for export. 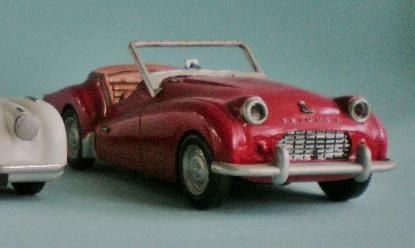 Standard had bought the re mains of the bankrupt and bombed out Triumph Company in 1944 and in the first few post war. Years had offered several undistinguished Triumphs. 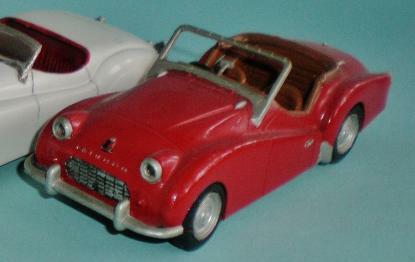 In the meantime, MG produced the TC and TD sports cars, and Jaguar had produced the famous XK120. Both took the US by storm, and consequently Sir John Black took the attitude that if they could succeed in the States, so could he. But it could not be done overnight. Chief styling Engineer, Walter Belgrove produced a new Roadster (the TRX) on a Standard Vanguard chassis, but it was too bulbous and had too many electro-hydraulic controls – it never got beyond the prototype stage. Next, Sir John tried an unsuccessful take over the Morgan company but after being rebuffed, decided to have another attempt ‘in house ‘. So, the real TR3 story starts in 1952 on a minimum cost/minimum-tooling basis. The result was a design using an obsolete 1936-39 Standard 9 chassis (over 500 were in stock in the parts dept.) onto which were grafted the Triumph Mayflower IFS and live rear axle. The Standard Vanguard engine was reduced in size by using small bore pistons and was slightly tuned by the addition of 2 SU carburettors, while the Vanguards 3-speed box was converted to 4-speed with a central gear change. Not at all what the Directors wanted to hear but, swallowing their pride, Richardson was invited to join the company to develop a better TR. Thus it was that the definitive TR was first seen at the Geneva Show in 1953. 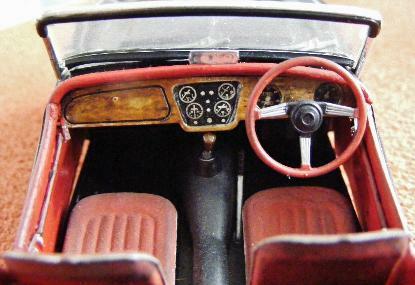 On sale from October 1955 to Summer 1957 the TR3 usually appeared as an open two-seater but a rear seat and bolt-on steel hard top were available on the optional extras list; as was a heater and an electrically operated overdrive unit on the top three gears, controlled by a switch on the dash'. The production engine was a 1991cc straight-4 OHV SU-H6 carburettors fitted with putting out 95bhp, a figure later raised to 100bhp at 5000rpm when the "high port" cylinder head and enlarged manifold were added. In 1956 the TR3 became the first British production car to be fitted with disc brakes when these superseded the original front drums. Suspension was by double A-arms with coil over shocks at the front (an anti-roll bar was optional) and solid axle and conventional leaf springs at the rear. The worm and peg steering was a weakness as the mechanism/linkage had considerable play, which only increased with wear. The stamped steel wheels were usually colour co-ordinated with the body colour or a standard silver, although optional 48-spoke wire wheels were available. 13,377 of the original TR3 cars were produced before the model had a “facelift" to became unofficially known as the TR3A from late 1957. The basic model cost £950 in the UK although only 1286 were actually sold in the UK, the majority of the cars went to the USA but exports to other countries did occur. When engineer Joseph E. Giammarino and businessman Abe Shikes formed Aurora Plastics Corporation in March 1950 it wasn't especially for the world of plastic model kit manufacturing but as contract injection moulded plastic product manufacturers. The model kit adventure started with the hiring of salesman John Cuomo in 1952 and the company moved in to this growing hobby market...... and Monogram and Revell suddenly had a big rival on their hands. The New York company was astute enough to aim their products at the younger model makers creating smaller-sized, less detailed models at a lower price point and cutting into the market very profitably. They advertised under the slogan "U - Ma - Kit" (You Make It) and this certainly seemed to strike a chord with the younger audience. The mainstay of Aurora was aircraft models and the first few years saw only aircraft being produced. 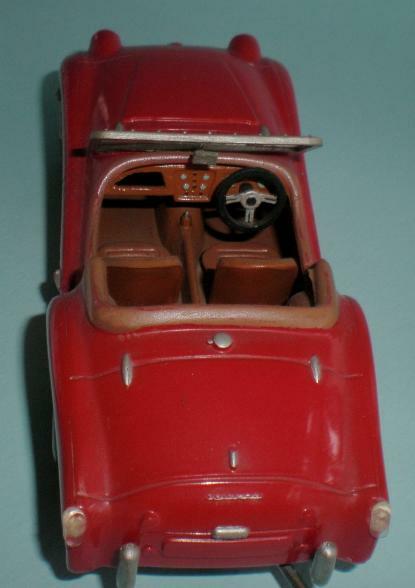 But by 1956 aurora was pushing into car models with both static model kits and slot cars, in fact Aurora produced HO gauge slot cat racing sets from 1960. What Aurora are best known for today though was their innovative tie-ins with movies. Aurora acquired licenses from Universal Studios to create figures of the Universal monsters such as the Frankenstein figure that appeared in 1961. Numerous films and TV shows were memorialised in this way and Aurora blazed the trail into what is now a burgeoning sci-fi and fantasy market. Many of Aurora's kits have later been re-released by Moebius, Atlantis and Monarch and Polar Lights, a name that was chosen as a reference to Aurora. In 1969 the company was sold and the founders retired. The investors expanded the range but with little success and sold on the company in 1971 to Nabisco who in turn sold the kits manufacturing side to early rivals Monogram in 1977. Monogram of course re-issued some of the kits but many moulds were stored away and unused. Amongst them somewhere are the car kits which haven't stood the test of time and are only available on the second hand market were some command surprisingly high prices. 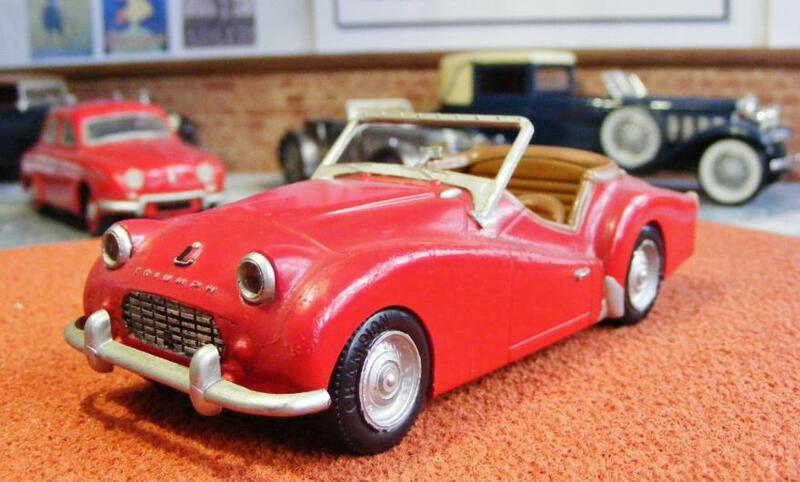 The Triumph TR3 kit, product # 518-49, is priced at about 130 Euros, approx' £100 to us Brits. 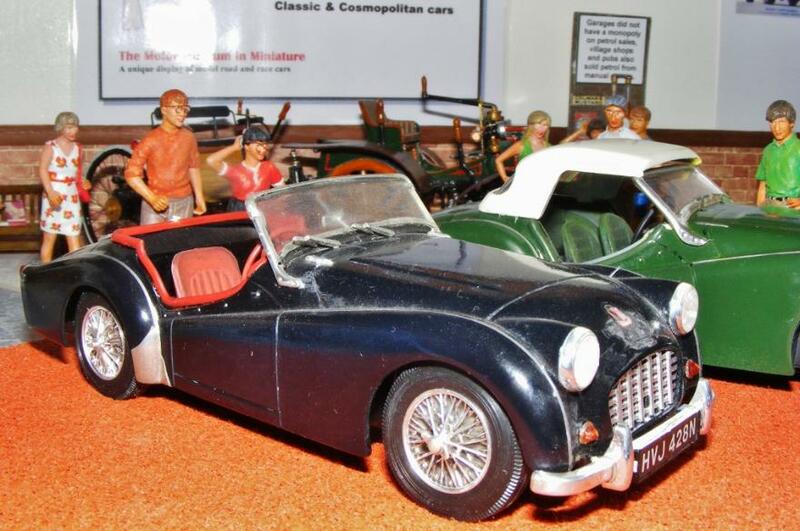 It is featured below with two other Aurora kits, the MG TD and Jaguar K120, which are both similarly valued in mint condition. Rod built the Aurora Triumph in the mid 1960s so it is constructed with tube cement and brush painted with Humbrol enamels. The point about Aurora's marketing strategy can be seen in the photo's so when Rod was able to get the Gunze Sangyo kit in 1/24th scale kit he didn't hesitate. Kit # G-186:1200 originally released in 1985 and is a lovely kit in it's own right. Gunze Sangyo have released some excellent car kits over the years and the quality of parts fitting in often as good as Tamiya but the subjects are from a much broader base than their Japanese rivals. This kits was built in the 'naughties' and is painted with Halfords acrylic car spray paints. Citadel and Revell acrylic paints supported good old Humbrol enamels for the detail painting.